The inspiration for this project came from my abiding fascination with birdsong. There was such interest (and discussion over group parameters!) 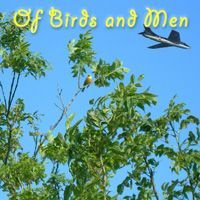 that we decided to have a group using only the sound of birds (cunningly entitled "Birds" and another combining birds with human generated sounds; "Of Birds and Men". "Building a Blackbird" incorporates two recordings of blackbird songs (naturesounds.be), recorded text from The Bird Study Book by T. Gilbert Pearson (archive.org), and a recording of construction workers building a deck in the back of my apartment in Chicago, IL. How does human behavior interact with bird behavior? How do humans interpret bird behavior? Do birds interpret human behavior? How do we build a blackbird? Or does it build us? In this track is explained how from birdwatching a theory was developed alternative to einstein's e=mc square. This theorie explaines such things as the big bang and the anti universe;it is anti creationist and anti darwinist, and offers a key to the understanding of cultures, time travelling, and the mysterie of time as opposed to space. Recorded live on an Ancient Sony Cassette Walkman in a kitchen in Berlin Neukölln, with a dictaphone, a walkman and the radio providing background noises.